…add the clams and toss vigorously for a couple of minutes, the heat on as high as it can go. Add some sliced green chilies if desired, lots of pepper and a sauce of black beans and garlic or black beans with some chicken stock, a little rice wine, a little oyster sauce and a touch of cornstarch. Photos by AT. MM was cooking. 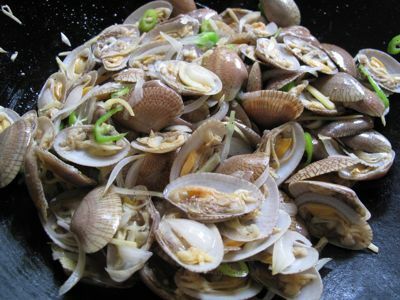 Those clams are very similar to the “angel clams” that used to buy sa Farmer’s market in cubao. Makapunta nga sa sunday. I think I will try this! one of our favorite dishes to order when in a Chinese seafood resto! Where did you get your clams if you don’t mind sharing? For dishes with black bean sauce, I usually add a small amount of brown sugar to cut on the saltiness. I got my clams from a vendor of frozen seafoods at FTI market, but Cold Storage in Rustan’s supermarkets also carries these. i guess fresh clams would have upped the flavor factor a lot. 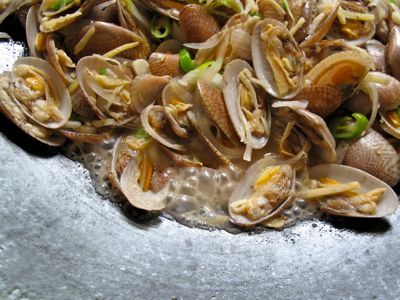 i think the philippines exports these clams to japan, but around the world, i think these are what are called “manila clams”? Here in Singapore they called it Manila Clams (Normally Live) and available in supermarket (NTUC). I do cook it tinola style or almost what MM do minus the black beans. Will try it out with MM style. when i was younger i would never eat clams cooked into tinola…i guess the sort of sweet-bitter flavor was too much. now i love them! this is a great addition to our menu! I saw those at Suki Market, Mayon, Quezon City, but was not sure about the taste. Those which I bought were not frozen, but apparently fresh. Did a similar stir-up, but with Fried Shrimp Paste from Malaysia, which I bought from Jas Mart in Suki Market too. My Sis-in-law gave it a thumbs up. These clams are also available fresh at SM Hypermart. 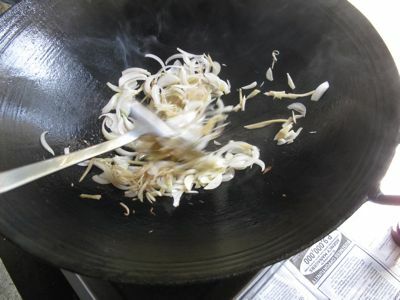 Try adding some chopped lemongrass for extra fragrance, MM. But nothing really like fresh clams as we all know…if you have a safe source. good on pasta, as well. Ay, hit-or-miss talaga ang frozen clams. I bought the Cold Storage ones a few times before and I’d rate them even lower than MM’s 7.5. My money & effort are on the live ones. However, if anyone does have a reliable source for frozen ones, would you be so kind as to pass on the info? 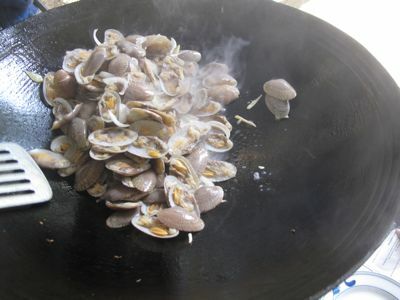 mm, in Negros they also call these nylon shell clams. 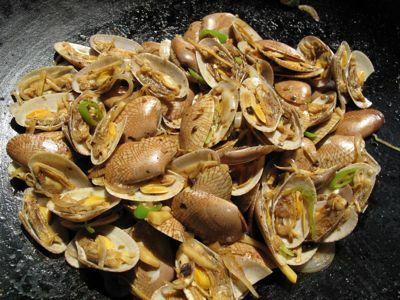 yeah, lots of these shells in Bacolod, we either add malunggay, green papaya and dahon ng sili…sarap! marikina city market. i get my clams from an old lady. ask her to crack a piece before you buy , so you would see that it does not contain silth or mud. clams are made to spit mud for a long time. so if you will buy from her, you can cook it instantly. her stall is inside the covered wet market. she faces a street and right in front of Psalm grocery. she also sells Tinapa bangus – deboned. tis one i also like with garlic rice and red salted eggs and tomato…. market man – hope to meet you someday! this is my comfort food..I remember eating this when I was a kid. I love clams! thanks for posting this. How much does this nylon shell cost in the market? Hi Marketman, I would like to try this recipe but I have no idea where to buy Black bean sauce and Rice wine (here in Manila). Do they have them at Rustan’s Supermarket? Jana, large groceries should have the black bean sauce and rice wine, places like Metro Gaisano at Market!Market!, Cash & Carry and Unimart, and probably Rustan’s and SM should have these. A Pine/Rose Wreath for PHP90 ($2)!! !